^ Telleen, Maurice. The Days Before Yesterday: 75 years ago. The Draft Horse Journal, 2001年秋. 2007年5月18日查阅自互联网档案. ^ 29.0 29.1 Have Faith in Massachusetts: A Collection of Speeches And Messages by Calvin Coolidge, 1919, ISBN 978-1-4179-2608-4. ^ 60.0 60.1 Rouse, Robert. Happy Anniversary to the first scheduled presidential press conference - 93 years young!. American Chronicle. March 15, 2006. （原始内容存档于2012-11-23） （英语）. ^ The National Archives, Prologue Magazine Vol. 32 No. 4 (Winter 2000). Article "Abrupt Transition", by C. L. Arbelbide. Accessed 2009-01-28. ^ An Appointment. Time. 1923-08-20 [2009-05-09] （英语）. 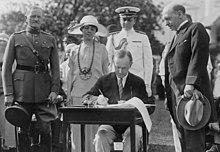 ^ Alvin S. Felzenberg, "Calvin Coolidge and Race: His Record in Dealing with the Racial Tensions of the 1920s. "（卡尔文·柯立芝与种族：他于1920年代处理种族紧张局势的记录） New England Journal of History（新英格兰历史杂志） 1998 55(1): 83-96. ^ Calvin Coolidge, the first US President to do a radio address 2-22-1924. 2008年2月22日. ^ President Coolidge, Taken on the White House Ground (1924). [2007-02-04] （英语）. ^ President Calvin Coolidge State Historic Site. [2007-02-12] （英语）. Coolidge, Calvin. The Autobiography of Calvin Coolidge (1929)（自传）, ISBN 978-0-944951-03-3. Barry, John M., Rising Tide: The Great Mississippi Flood of 1927 and How It Changed America (1997), ISBN 978-0-684-84002-4. Ferrell, Robert H., The Presidency of Calvin Coolidge (1998), ISBN 978-0-7006-0892-8. Fuess, Claude M., Calvin Coolidge: The Man from Vermont (1940), ISBN 978-0-8371-9320-5. 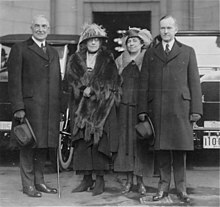 Greenberg, David, Calvin Coolidge, The American Presidents Series, (2006), ISBN 978-0-8050-6957-0. Hannaford, Peter, The Quotable Calvin Coolidge (2001), ISBN 978-1-884592-33-1. McCoy, Donald, Calvin Coolidge: The Quiet President (1967), ISBN 978-0-945707-23-3. Russell, Francis, A City in Terror: Calvin Coolidge and the 1919 Boston Police Strike (1975), ISBN 978-0-8070-5033-0. Silver, Thomas B., Coolidge and the Historians (1983), ISBN 978-0-89089-038-7. Sobel, Robert, Coolidge: An American Enigma (1998), ISBN 978-0-89526-410-7. White, William Allen, A Puritan in Babylon: The Story of Calvin Coolidge (1938), ASIN B000O16342. Wilson, Joan Hoff, Herbert Hoover, Forgotten Progressive (1975), ISBN 978-0-316-94416-8.